NOTE: Charlottesville Tomorrow is a non-partisan organization covering local elections. It did not cover 2007 elections for School Board, Commonwealth's Attorney, Albemarle County Sheriff, or Soil and Water Director, Thomas Jefferson District. 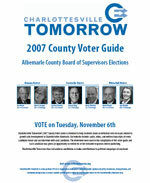 On November 6, 2007 Albemarle County held local elections for three seats on the Board of Supervisors, four seats on the Albemarle County School Board, as well as for Albemarle County Commonwealth's Attorney, Albemarle County Sheriff, and Soil and Water Director, Thomas Jefferson District. The City of Charlottesville held local elections for three seats on City Council, three seats on the Charlottesville City School Board, and Soil and Water Director, Thomas Jefferson District. ↑ 1.00 1.01 1.02 1.03 1.04 1.05 1.06 1.07 1.08 1.09 1.10 1.11 "November 6, 2007 General Election Official Results." Virginia State Board of Elections. 08 Nov. 2007. 23 June 2009 <http://www.sbe.virginia.gov/cms/Index.html>. ↑ Web. Brown Announces Bid for City Council, Sean Tubbs, News Article, Charlottesville Tomorrow, April 25, 2007, retrieved April 17, 2018. ↑ Web. 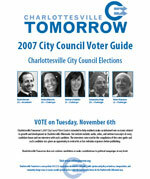 Brown, Edwards & Huja Nominated for Council, Brian Wheeler, Charlottesville Tomorrow, June 2, 2007, retrieved March 11, 2013. This page was last edited on 17 April 2018, at 11:46.